Stump removal and subsequent issues can leave craters or unsightly holes in your lawn that nobody wants their children playing around near or their neighbors to see. Not to mention the dangerous hazards that these holes or divots in your lawn can pose to your children and little ones. The families and generations of customers that continue to add to the business and reputation of our company are always on our minds. The trials and tribulations of a stump removal process can really wear a homeowner down when they don’t have the skill and labor force to remove a whole stump from the ground they usually have to turn to us. The professionals at Baytown Tree Care take your notes and specifications on what diameter and type of tree stump you will need removed. After we bring our trucks down to you at you families home we can get our wenches and industrial strength straps tightened correctly and forcefully around the base of the stump. After ripping the stump from the ground we take care of the biodegradable remnant, as we will feed it directly into our wood chipper that rids your yard of the ugliness and awkwardness of a random stump. When other stump removal services fail we come through for our residential and commercial customers. We do parks and large plots of land, and we take care of these projects fast. Unlike those other companies we will not our inability to complete the project hold you up. Our representatives give concise estimates on exactly when and how long it will take to complete this stump removal process since our customer’s free time and the value of their time is definitely something we always keep in consideration. When considering who to call when you think that it would be impossible for any one else to yank your pesky stump, give us a try. We have not found a stump removal project we could not complete with neatness, courtesy, and overall satisfaction. Help us to help you remove those problem stumps with our industrial strength wood chippers and tough as nails removal people who make sure that any problem stump can become an opportunity for our state of the art removal system to totally impress you as the customer. Do not hesitate to call today for any problem stumps that are becoming a home improvement project that simply never gets done. At Baytown Tree Care, general stump removal and grinding is definitely one of our bedrock services that make up a large part of our total business. Taking this into account we direct much of our labor force and efforts towards making our stump removal process the neatest and fastest way for you and your family to hoist that eyesore from your elegant lawn. Doing so results in our customer’s overall happiness with the best in the stump removal business. Just give us a call and let us know when we can send out a team to being work on your unwanted stump! 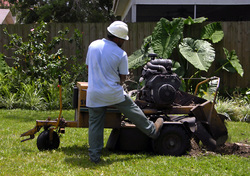 Call (281) 975-0077 to get rid of those pesty stumps!